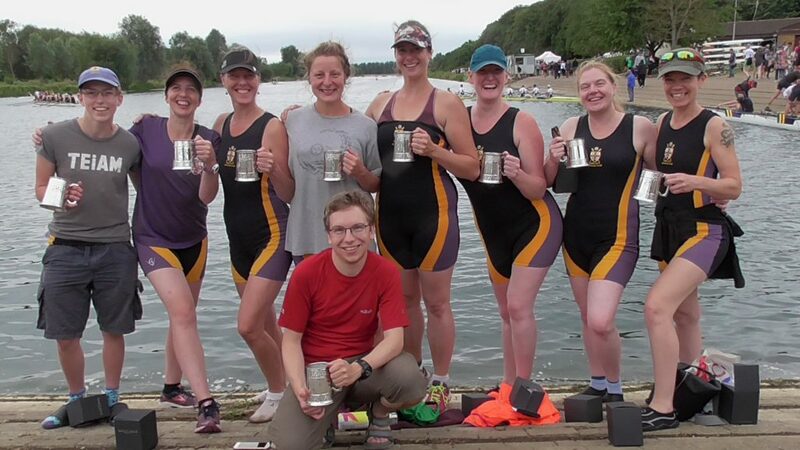 Pots at Peterborough Summer Regatta 2018. It was a busy weekend of YCRC at Peterborough Summer Regatta, with the senior men and women racing over 1 km and 500 m, bringing home a few pots in the process. On Saturday the women’s squad were out in force. In the W2x, Sophy and Helen S (Band 2) came third in their heat, with Rachael and Emily also coming third in the heat of their Ban 3 W2x. Two W4+ were entered in Band 3, with the novice 4+ coming third in their heat, and the senior 4+ winning their heat before coming third in their final. Rhiannon came second in her heat of the W1x (Band 3), but missed out on a place in the final through the repechage, whilst the W8+ (Band 1) came second in their final. On the men’s side, the 8+ came second in their heat to progress to the final where they finished fourth. Two 4- (Band 2) were fielded, with the ‘Alexander’ crew progressing to their final where they came fourth. The 4x- (Band 2) just missed out on progression in their heat, coming third, and the 2- (Band 2) came fourth in their heat. Saturday wins came from the women in singles! Margit continued her fantastic season winning the WMasB 1x, and Helen Waller. took home a great win in W1x (Band 2) to see her on her way to the British Rowing Sculling Festival next weekend. Sunday brought close racing over 500m. The women’s squad raced in two coxed fours, acquitted themselves well in their heats but not progressing. Of the W2x (Band 2), Georgie and Lydia were raced out in their heat, whilst Sophie and Helen Sneath came second in their heat, losing out in the repechage. Sue & Margit, racing in the WMasB/C2x , were beaten into second by a quick Cantabs crew. The Mx8+ won their heat but were edged into fourth in the final. The men’s squad single scullers fought hard, with Jez (1x Band 1) coming up against stiff opposition in his heat to come fourth, and Chris J (1x Band 2) coming second in his heat and in the repechage. Performance of the weekend has to go however to our W8+ (Band 2) of Cathryn, Bernie, Rachael, Emily, Helen Wilkinson, Nikki, Rhiannon, Debbie, Mike for their fantastic win by nearly two seconds over a tightly-packed field. Most of the crew were those who joined after out 2017 taster sessions – a great way to round off their first year of rowing! Thanks to Paul and Charlie for trailering!